The Friday salat (prayer) is obligatory on all Muslims. 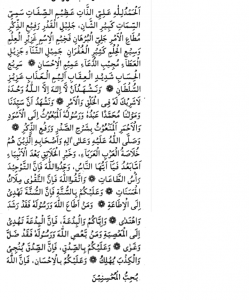 There is a full surah (chapter) in the Holy Quran on the Friday prayer (Surah Jumma). However, in the Shia school there is difference of opinion whether Friday prayer is obligatory, especially if the call to prayer is made by a representative of an unjust ruler who is known to be a violator of God’s commandments. Nevertheless, those who regard it as obligatory attend Friday prayers. Some Shia scholars have allowed offering Friday prayers led by a Sunni imam if there is no Shia centre or mosque close to their residence or place of work. Timings for the Friday salat differ depending upon the schedule of prayers observed in each country by each school of thought, but it cannot be offered before the sun has crossed the midday point (noon). Friday prayer cannot be performed individually. It is offered at a mosque or Islamic centre which organises Friday prayers in a large gathering. The Friday salat consists of two rakat prayers preceded by a khutba (sermon). The khutba is delivered in the Arabic language and has a set structure, which has been followed by imams all over the world for centuries. However, within the set structure there is space for discussing a particular theme chosen by the imam. Muslims who attend Friday prayers regularly know that the Friday sermon can be both original and repetitive in content at the same time. In some countries where religious authority is exercised by the state, the department of Islamic affairs approves Friday khutbas in advance of delivery. In other countries the imam is free to choose the theme and requires no prior clearance from the state authorities about the contents of his sermon. However, all khutbas become an official record of the mosque where these are delivered. Some internet savvy mosques webcast their khutbas through live streaming; other mosques upload the audio/video of the khutba on their website. At the Faisal Mosque in Islamabad the Friday khutba is also printed on paper and distributed to the faithful to take home after prayers. In small mosques in villages the khutba is delivered by the imam without any written text and once delivered, there is no record of the khutba to refer to it subsequently. This has to do more with the lack of sophistication and scarcity of resources than any established custom or rule. In many non-Arabic speaking countries, while adhering to the Arabic text, many imams speak to the congregation in the local language to explain the khutba they have selected for the day. In some countries where Arabic is not the mother language of the people, the imams combine their sermon in the local languages in such a way that the integrity of the original khutba in Arabic is retained. In some other mosques imams deliver a small talk on the theme of the khutba in the local language after the first adhan (call to prayer) and thereafter, they deliver a short full khutba in Arabic (in two parts) after the second adhan, followed by the Friday salat. In countries where people are at work on Friday and have little time available for Friday service, the khutba is kept very short (only in summary form) to fulfil the requirement of the Friday prayer. But in countries where Friday is a holiday or where allowance is given for Friday prayers during a working day, the Friday khutba takes between 15 to 30 minutes, preceded by Friday salat which takes another 15 minutes to complete. The greatest advantage of sticking to a set format of the khutba in Arabic is its universality. On a Friday, all the mosques in the world deliver the sermon in the same style and structure with which Muslims are familiar. So whether you are a Saudi Muslim offering Friday prayer in the United States or a British Muslim reading the Friday prayer in a mosque in Nigeria, you will not come across any major variations in the khutba to cause confusion about the theme and the message. This universality of approach coincides well with the concept of one faith and one Ummah, irrespective of the different schools of thought and jurisprudence, no matter where a Muslim comes from and what is his/her preferred ethnic, linguistic or national identity. Muslims whose first language is not Arabic sometimes think they miss out on a large part of the khutba because they can’t understand it. However, when one looks at the anatomy of the khutba, less than one third of it is about a new topic, and the remaining two third is about the verses of the holy Quran, sayings of prophet Muhammad sallalaho alaihe wasallam (peace and blessings of Allah be on him) and supplications recited in daily prayers. A practicing Muslim who prays five times a day and attends 52 Friday khutbas in a year cannot complain he does not understand what is being said in a khutba delivered in Arabic. For the remaining one third material which is new in a khutba, most imams are increasingly making an effort to explain the topic of discussion in the native language of the audience in their talk prior to delivering the khutba, or they add the translation to the main body of the khutba, as required. The Friday sermon is delivered by the imam standing up and often holding a wooden staff. For better visibility, the imam walks up to a member (a raised platform). 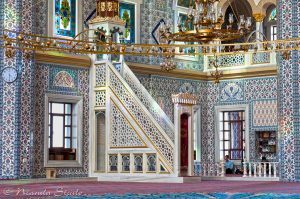 In mosques which are designed after Ottoman architecture, the member is quite distinguished as it is sometimes six feet high and has eight to ten steps. The khutba consists of two Sections. Each Section has three parts – the start, the middle and the end. The first Section contains glorification and sanctification of Allah, salutations on prophet Muhammad sallalaho alaihe wasallam, some Quranic verses and sayings of the prophet on the chosen theme of the khutba and supplications seeking Allah’s forgiveness. The second Section includes salutations to prophet Muhammad sallalaho alaihe wasallam, his family and companions, supplications for the ummah’s salvation, safety and security, and a couple of warnings and advice from the imam about Islamic manners and finally asking them to stand up to offer the Friday prayer. 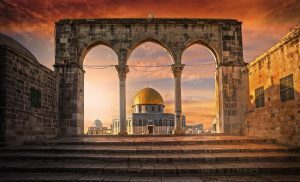 Each of the two Sections of the khutba is interspersed by a short break of a couple of minutes during which time the imam sits down and silently recites a brief dua. The congregation also recites a quiet dua (any dua seeking Allah’s forgiveness) during this break. The following is an explanation of the composition and content of the Friday khutba in Arabic. The khutba starts with the praise of the great and glorious Allah and a brief account of His blessings. It also includes salutation to His prophet Muhammad, sallalaho alaihe wasallam. Translation: All praise is due to Allah. We praise Him. We seek help from Him. We ask for his forgiveness and protection. We trust Him alone and we seek refuge in Him against the evils and mischief of our self, as well as from the consequences of our bad deeds. Translation: Whosoever is guided by Allah on the right path, no one can misguide him; and whosoever has been left astray by Allah, no one can guide such person to the right path. Translation: We bear witness that there is no god but Allah. He is alone and has no partner. We bear witness that Muhammad sallalaho alaihe wasallam is His servant and apostle. O servants of Allah, may Allah be merciful to you. Translation: Of all the books, the Book of Allah is the best; and of all the apostles of Allah, Muhammad sallalaho alaihe wasallam is the best apostle. Of all the deeds, the good deeds are recommended and bad deeds are forbidden. What is forbidden leads one astray. He who has been led astray is lost in darkness. And the darkness of sins leads to Hellfire. The imam now comes to the main theme of the Friday khutba which varies in length and the topical events and issues facing the Muslim community, especially the youth in each country. Translation: After this, I seek protection of Allah from Shaitan, the accursed, and begin in the name of Allah, the beneficent and most merciful. The imam recites a minimum of two verses from the Holy Quran on any chosen theme of the Friday khutba from a wide variety of topics discussed in the Holy Quran. The verses can also be about paying zakat, fasting, hajj, and Muslims’ obligations and duties toward Allah and human beings. Usually, there is no commentary on these verses, as khutba is meant to be concise and not too lengthy. However, some imams choose to speak for about 10 to 15 minutes on the chosen theme as this is the only part of khutba which is different from the other text at the beginning and end of each of its two Sections. After reciting the relevant verses from the holy Quran, the imam recites at least two hadith (sayings of the prophet) from the authentic collection of ahadith relevant to the theme. The long chain of narrators of hadith is usually excised from the khutba to save time. Translation: O Muslims, fear Allah and speak the truth. He will make your deeds good and forgive your sins. Whosoever obeys Allah and His apostle has attained great success. Translation: O Muslims, fear Allah as is His right to be feared and do not die except when you are in a state of faith as a Muslim. Translation: O mankind, fear Allah; He has created you from one single soul and thereafter created your spouses and many men and women. Fear Allah because you will be questioned about your dealings with your kin and near ones. Verily, Allah keeps a watch over you. Translation: O Muslims, stay away from sin; whoever disobeys Allah and His apostle is led astray from the straight path. Translation: O Muslims, be truthful because truth leads to salvation whereas falsehood leads to destruction and death. Translation: O Muslims, bestow favours on others, for Allah loves people who are generous. Translation: O Muslims, remember whosoever keeps company with conceit and looks down upon others, will be sent to Hellfire. Translation: May Allah bless us and you from the recitation of the holy Quran and enlighten us and you from His signs and the wise commandments in His scripture. I seek forgiveness from Allah for me and for you and for all the Muslims; so seek His forgiveness. He is most forgiving, the merciful. The imam sits down for a minute to recite a silent dua at the conclusion of the first Section. The audience also follow the imam and quietly recite a short dua, or keep silent. In this Section, after the opening phrases glorifying Allah and His apostle Muhammad sallalaho alaihe wasallam the imam sends salutations on the prophet, his family and companions. Translation: All praise is due to Allah, the Lord of all worlds. May the greetings and peace be upon His messenger, Muhammad, sallalaho alaihe wasallam, and upon his family and upon all his companions. Translation: Allah and His angels send salutations on the prophet sallalaho alaihe wasallam. “O you who believe, send salutations and blessings upon the prophet sallalaho alaihe wasallam” (this is a verse from the holy Quran 33:56). O Allah, send Your worthy blessings upon Muhammad sallalaho alaihe wasallam, who is your servant and apostle and also send your worthy blessings upon the faithful men and women. Translation: O Allah, send your greetings upon Muhammad, sallallaho alaihe wasallam, and upon his spouses and his family just as you sent your greetings upon Abraham and his family. O Allah, bless Muhammad and his family, just as you blessed Abraham and his family. Translation: We also send countess blessings on the companions of Muhammad sallalaho alaihe wasallam, particularly the most kind and truthful Abu Bakr, may Allah be pleased with him; the most staunch of them in the affairs of Allah, Omar, son of Khattab who was truthful, upright and just, may Allah be pleased with him; the most modest Uthman, son of Affan, who was perfect in faith, may Allah be pleased with him; and the just and victorious lion of Allah, Ali, son of Abi Talib, may Allah be pleased with him; and the spiritually distinguished martyrs Hasan and Hussain, sons of Ali, leaders of the youth of Jannah, may Allah be pleased with them; and on their pious and honoured mother Fatima, leader of the pious women in Jannah; may Allah be pleased with her; and on the two noble uncles of the prophet, Hamza and Abbas may Allah be pleased with them; and on the six other worthy companions of the prophet upon whom Allah has bestowed the glad tidings of eternal bliss, may Allah be pleased with them; and on the custodian of the trusts of the ummah, Abu Obaidah ibn Jarrah, and on all other associates and disciples of the prophet Muhammad sallallaho alaihe wasallam. Translation: The prophet said: fear Allah; fear Allah in the matter of my companions. The best era is the era of my generation and that of my companions. Do not make my companions targets of censure after me. Whosoever loves them, it is because of my love that he loves them and whosoever hates them, it is because of my hatred that he has hatred toward them. Whosoever has hurt them has hurt me, and whosoever has hurt me, has hurt Allah. In this part, the imam makes supplications seeking forgiveness, blessings of Allah and safety and security of all Muslims. These are standard duas which are usually recited at the end of obligatory prayers and religious gatherings. The audience joins the imam with refrains of Ameen repeated at the end of each dua. In the end of the khutba, the imam delivers the final remarks reminding the congregation about respecting lawful authority, doing good deeds, refraining from major sins and remembering Allah in their lives. Translation: Slaves of Allah, may Allah have mercy on you. A Muslim ruler is the shadow of God on earth; whoever supports the ruler, Allah will support him. Translation: Verily, Allah commands you to act with justice, to confer benefits upon each other and to do good to others as one does to one’s close relations. And Allah forbids shameful deeds which pertain to your own selves, and injustice which affects others, and He prohibits revolt against lawful authority. Translation: Remember Allah, who is supreme in glory and He will remember you; and be thankful to Him, and He will increase you in bounty; and seek His forgiveness, He will forgive you and make for you a way out of your issues. Translation: Verily, the greatest virtue is the remembrance of Allah, the most superior, elevated, glorious, faultless, magnificent and greatest. May Allah accept our good deeds and save us from raising unnecessary debates about completely doing away with the Arabic khutba and replacing it with speeches in the native languages of the worshippers which, if done, will lose the organised structure of the khutba read out in millions of mosques in different countries over centuries. There is sufficient room in the present structure of the khutba to add original themes depending upon the needs of Muslim society in our times as long as there are supporting verses from the holy Quran and sayings of the prophet to back up those themes. There is also flexibility in Section 2 of the khutba in regard to detailed or abridged salutations, such as the advice for supporting lawful authority. Even if some of these phrases are omitted, these do not take away the real essence of the khutba. There is also no issue if the local translation of the theme is added in Section 1 of the khutba without doing away with the original Arabic text; or by giving a short talk on the theme of the khutba prior to formally reading out the khutba after the second adhan. However, some imams recite the Friday khutba with such a speed and poor pronunciation that the audience is put off completely for the assassination of such a beautiful language and the message it contains for the believers. These imams need to be more careful and do justice to their duty. So with all the flexibility already there in the prevalent Arabic model, there is no weight in the argument to remove it with local texts. Remember the wise saying: ‘Don’t fix it if it ain’t broken’. Jazakum Allah. 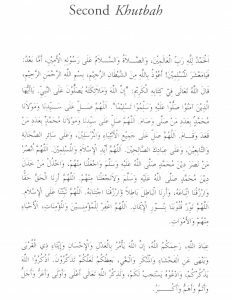 The Arabic terms used in this essay are: khutba or khutbas for plural (sermon); salat (congregational prayer); rakat or rakats for plural (a unit of the prayer which is made up of one of 2, 3 or 4 rakats); imam (the minister of religion who conducts the prayer service) member (a small raised stage); dua or duas for plural (supplication); ummah (global Muslim community); sallalaho alaihe wasallam (salutation, meaning peace and blessings of Allah be on His servant and apostle Muhammad); surah (chapter of the holy Quran); adhan (call to prayer); hadith or ahadith for plural (sayings of prophet Muhammad; Jumma (Friday); Shaitan (devil); adhan (call to prayer); jazakum Allah (May God reward you).